I just finished my can of ‘pepsi’ as the Victoria Line pulled into Brixton Underground station and walked past the masses of skelpers on the street to enter the Brixton Academy once more. I found my friends in a good spot close to the stage, not so close that your constantly being battered by a stray elbow. Although I was expecting the band to be good, I was not expecting to be blown away. They had a choir on the stage and even chatted with the crowd which is not something I had seen in the many Youtube videos I watched in preparation for this gig. Highlights were of course Breezeblocks, Something Good and Matilda, but my new favourite track would have to be Taro which was played as the encore. 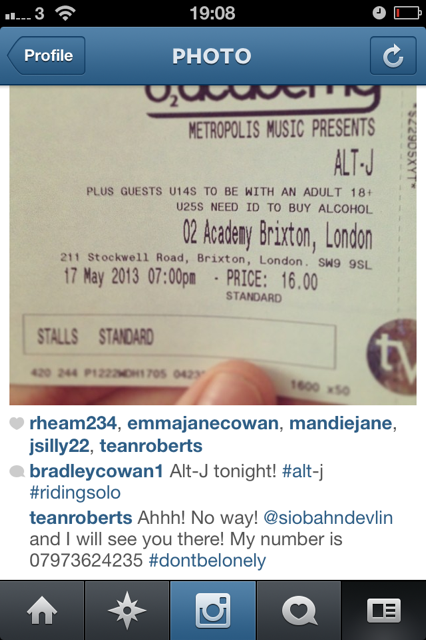 This entry was posted in Uncategorized and tagged alt-j, brixton academy, live music, london. Bookmark the permalink.